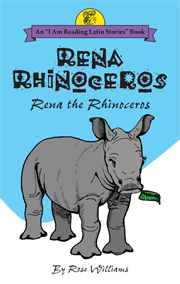 Rena Rhinoceros is the fourth of the four-book "I Am Reading Latin Stories" Series. Each book is independent, but Rena has a few more verb forms than the first three books and explanations for them. By illustrations and a simple Latin story it tells of a little rhinoceros who is impatient to be grown up but learns that this take time.